In this thing she must not stand alone. ¶ 2 Leave a comment on paragraph 2 0 Why would philatelists debate whether the U.S. Post Office Department (USPOD) should issue its second special commemorative stamp series promoting Omaha’s Trans-Mississippi Exposition held in 1898? Five years earlier, the Department printed the first commemorative stamp series celebrating the World’s Columbian Exposition in Chicago. The “Columbians,” as they became known, were extremely popular and interested many Americans in collecting them. Viewing the Columbians as a successful way to promote and celebrate a World’s Fair, the organizers of the Trans-Mississippi convinced postal officials to support the 1898 exposition by printing another series of commemoratives. An unknown poet, quoted in the poem above, represented the feelings of many philatelists who predicted that the USPOD would be crushed by the “jubilee rush” once postal officials conceded to printing the Trans-Mississippis because every town would want a stamp celebrating a significant event in its history. That rush came twenty years later as philatelists presciently saw the USPOD would be bombarded with commemorative requests and that the Department might try to capitalize of the collectability of limited-issue stamps. ¶ 3 Leave a comment on paragraph 3 0 Until the Columbians, the USPOD was basically indifferent to collectors and printed definitive stamps solely designed for sending materials through the mail. Seeing the Department’s increased interest in collectors’ activities concerned some philatelists who believed that the US postal service and other stamp-issuing agencies might flood the stamp market—culturally regulated by philatelists who developed methods for valuing stamps beyond government-issued values. Acknowledging these public debates, the USPOD proceeded with their commemorative stamp program that promoted American World’s Fairs by presenting scenes from the American past. The last decade of the nineteenth century marks a turning point in the relationship among the USPOD, philatelists, and non-collectors as the post office and other government entities began influencing a leisure time activity that the agency previously ignored. 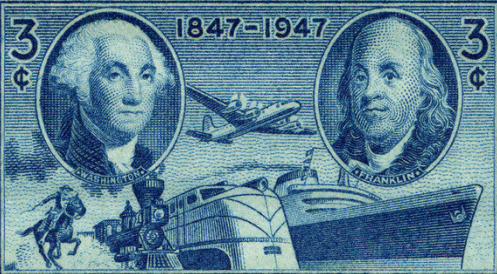 Simultaneously, the USPOD began circulating historical narratives on stamps, making stamps important artifacts that imprinted specific interpretations of the American past on cultural memory.